1. You could make just the spicy cucumber salad. 2. You could make just a spicy eggplant salad. 3. 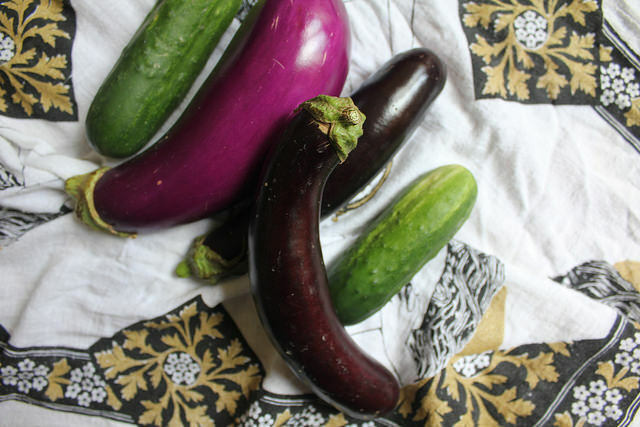 You can make a spicy eggplant and cucumber salad. 4. You can make just spicy cold noodles. 5-7. And you can toss those noodles with either one of, or both, these chilled salads. Just spicy eggplant and cucumber salad. 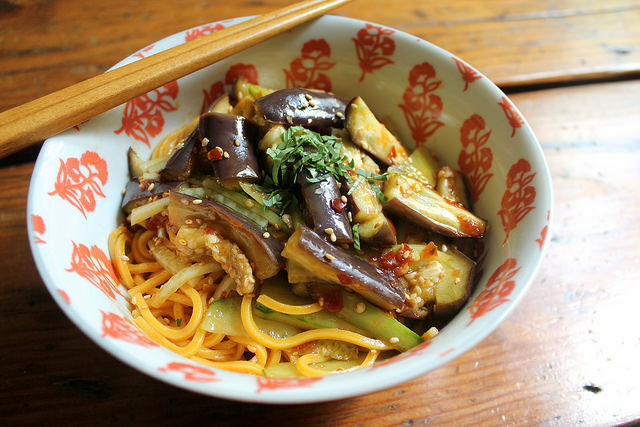 But if you have eggplant and cucumber, as we have much of in the summer, then you should go for the dynamic duo—with cold noodles (or without as a side dish). What a duo they are. I wonder why eggplants and cucumbers aren’t seen too often prepared together. It’s not a classic pairing like either one of those ingredients with tomatoes as a partner: eggplant caponata, for instance, or cucumber-tomato salad. 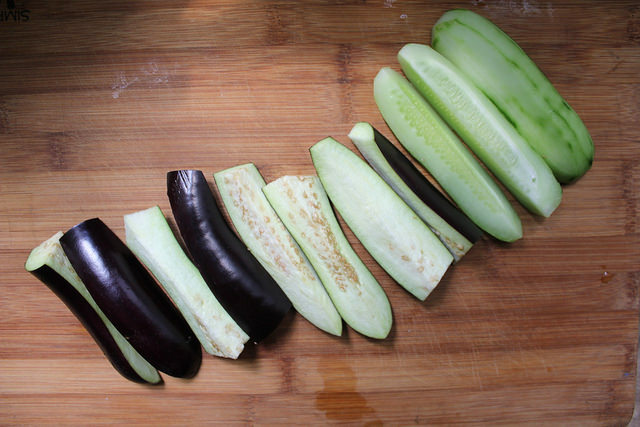 Varieties of Asian eggplant, and Kirby cukes. Tomatoes are sort of a bridge between these two summer veggie extremes. 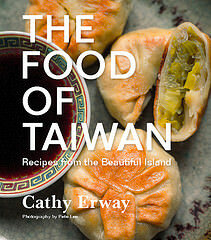 As far as vegetables go, eggplant are considered meaty and substantial, associated with heartier fare (e.g. eggplant parm). Whereas cucumbers are as light, cool and crisp as… well, its name. They’re also served fresh, never soft and rarely warm. And eggplants are typically cooked until mush. We have another yin-yang dish. And if you’re really into that thing, all meals should truly be in balance like that. Chopping the eggplant and cukes in long spears. 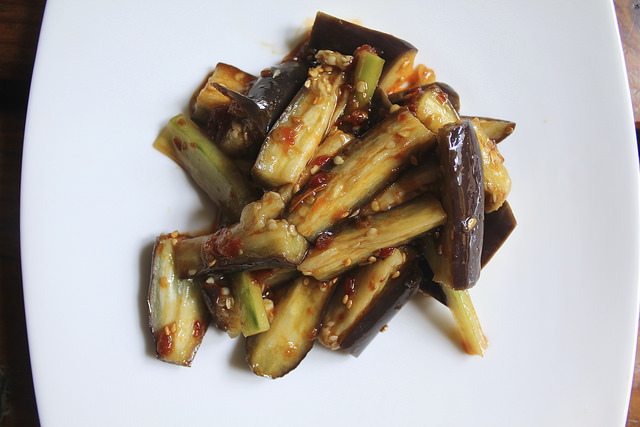 Is it necessary to use Asian eggplants when making this dish(es)? Not at all. 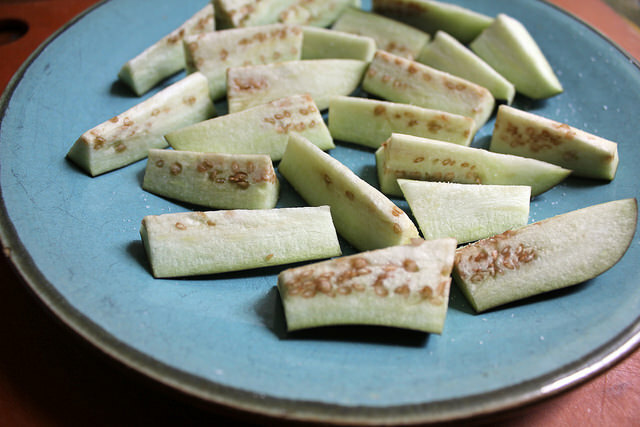 You can cut pieces with any eggplant to soften by steaming them simply, as I’ve done here. But I will maintain that the higher skin-to-flesh ratio of Asian eggplants is ideal for making bite-size pieces — actual pieces, rather than congealed mush. Then, if you don’t mind a more messy, loosey-goosey eggplant salad, that’s totally fine, too. Maybe it’ll become more saucelike when you stir it with your noodles. 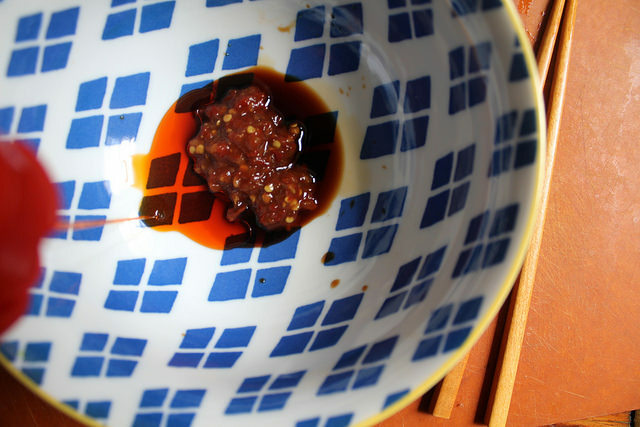 A drizzle of chili oil is added to sambal olek and soy sauce. With that, there are no absolutes when it comes to mixing up the sauce. I used sambal olek, a tangy Vietnamese chili and garlic sauce. It has a fresh-tasting kick and vibrant color, which is nice to have in the summer. You can use another green capped Vietnamese sauce that everybody knows as Sriracha, which has a smoother body and a sweeter, more “cooked” flavor, I think. Along with that, you’ll want to add some oil to glisten the noodles and permeate its flavor throughout. I went with a few dollops of a chili-infused sesame oil; you could also add just plain sesame oil and more heat to your liking instead. Then, just add vinegar and soy sauce to taste. Chopped eggplant is dusted with salt before placing in a pot with boiling water underneath to steam. Steaming eggplants is an easy, relatively hands-off process. Screw the bamboo steamer—you just need to find a pot with a lid and a plate that fits inside it. Something to prop up that plate inside the pot to elevate it from the boiling water underneath is necessary; an upturned bowl usually does the job. Cooked otherwise, eggplants usually soak up so much oil in order to soften and not burn; when they’re steamed, they soften through quickly, especially if you chop them to small pieces first. Tossing the cukes in dressing; the steamed eggplants, once cooled are added afterward. No need to cook the cukes, though. Those crisp slices can slip into the pool of redness which is your sauce immediately. Once the eggplants are sufficiently steamed through and cooled a bit, they’ll join them here. Then it’s just a matter of cooking some noodles to drain and rinse cold. I’m not opposed to linguine, soba, or curly instant ramen noodles here. I used some yellow chow mein noodles from my local deli, which has a lot of ingredients popular to Caribbean fare (like chow mein noodles are, incidentally). At once refreshing yet savory enough to satisfy for a meal, this is one good bowl o’ spicy noodles. Mix and match with it as the occasion suits. Cook the noodles according to the directions on the package; drain. Immediately rinse with cold water and toss until noodles are chilled. Let dry a few minutes, or while you prepare the rest of the ingredients. Fill a large pot with a lid with about 1 inch of water at the bottom. Bring to a boil. Place an upturned bowl or a steamer rack at the bottom of the pot. Arrange the eggplant pieces on a plate that fits inside the pot. Sprinkle the eggplant pieces with salt and place in the “steamer” and cover. Let cook for 5 minutes. Inspect the eggplant, and if the pieces give away easily when touched, remove from the steamer, drain any liquids from the plate, and let cool. 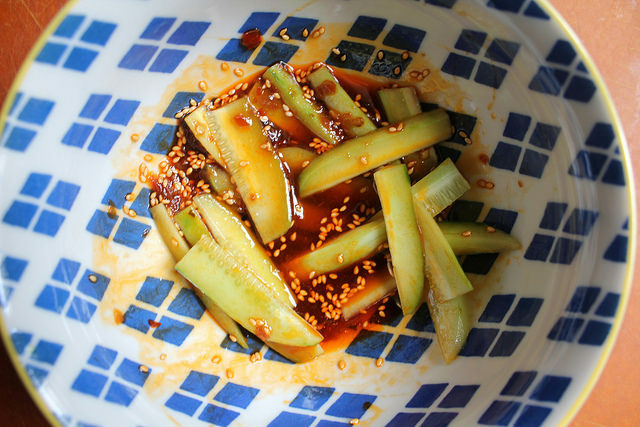 Combine the soy sauce, rice vinegar, sesame oil, red chili oil, and optional sugar and sesame seeds in a bowl. Adjust the seasoning to your preference, adding more soy sauce or sugar as desired. Add the cucumber pieces and toss to coat thoroughly. Add the cooled eggplant pieces and fold in gently. Divide the chilled noodles amongst serving bowls; top each with the dressed eggplant and cucumber mixture. Top each with the optional herbs, and serve immediately. Five brownie points: Not bad at all. But not particularly bursting with super foods, either. That’s okay. You’re getting a lean, full meal from all plant-based sources that’s as tasty as can be. Slurp it up and feel refreshed (not heavy, not gross) afterwards. 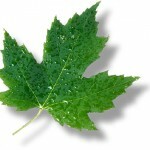 Six maple leaves: Cucumbers and eggplant are such easy garden veggies to grow, and easy to find at the height of summer from a nearby farm. The seasonings (chili sauce, soy sauce, sesame oil) might be imported, but the pantry staples can help make any such local, low-carbon veggie satisfy without the need for meats. The “everything” variation sounds tastiest to me. Irresistible, in fact. Somehow, I’ve managed to have never steamed eggplant of any type. I’m dying to try it out. I have to think that this would last a couple of days in the refrigerator, don’t you think (I’m a single person living alone)? I’m on board with anything that involves noodles! This looks delicious. Will have to try it soon. Thanks for sharing! @Randy: Yup, I’d give that a green light. Might be a little drier, but not to worry. I would like to make this IMMEDIATELY. Yum. I never considered steaming eggplant – thank you! Every piece of this dish looks delicious and they definitely go well together. Do you have a preferred brand of dried noodle you use for Asian recipes?